^ a b c Warwick, Roger; Peter L. Williams (1973) . “Angiology (Chapter 6)”. Gray's anatomy. illustrated by Richard E. M. Moore (Thirty-fifth Edition ed.). London: Longman. pp. 588—785. ^ Sloop, Charles H.; Ladislav Dory, Paul S. Roheim (March 1987). “Interstitial fluid lipoproteins”. Journal of Lipid Research 28 (3): 225--237. PMID 3553402. http://www.jlr.org/cgi/reprint/28/3/225.pdf 2008年7月7日閲覧。. ^ Pepper, Michael S.; Michaela Skobe (2003-10-27). “Lymphatic endothelium : morphological, molecular and functional properties”. The Journal of Cell Biology 163 (2): 209--213. doi:10.1083/jcb.200308082. PMID 14581448. http://www.jcb.org/cgi/content/full/163/2/209 2008年7月6日閲覧。. ^ a b Shayan, Ramin; Achen, Marc G.; Stacker, Steven A. (2006). 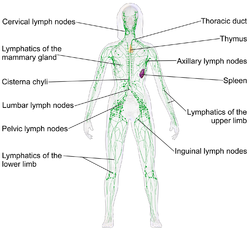 “Lymphatic vessels in cancer metastasis: bridging the gaps”. Carcinogenesis 27 (9): 1729. doi:10.1093/carcin/bgl031. PMID 16597644. http://carcin.oxfordjournals.org/cgi/content/full/27/9/1729. ^ a b Baluk, Peter; Jonas Fuxe, Hiroya Hashizume, Talia Romano, Erin Lashnits, Stefan Butz, Dietmar Vestweber, Monica Corad, Cinzia Molendini, Elisabetta Dejana, and Donald M. McDonald (2007-09-10). 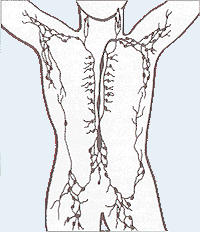 “Functionally specialized junctions between endothelial cells of lymphatic vessels”. Journal of Experimental Medicine 204 (10): 2349--2362. doi:10.1084/jem.20062596. PMID 17846148. 10.1084/jem.20062596. http://www.jem.org/cgi/content/full/204/10/2349 2008年7月7日閲覧。. ^ a b Rosse, Cornelius; Penelope Gaddum-Rosse (1997) . “The Cardiovascular System (Chapter 8)”. Hollinshead's Textbook of Anatomy (Fifth Edition ed.). Philadelphia: Lippincott-Raven. pp. 72—73. ISBN 0-397-51256-2. ^ Goldsby, Richard; Kindt, TJ; Osborne, BA; Janis Kuby (2003) . “Cells and Organs of the Immune System (Chapter 2)”. Immunology (Fifth Edition ed.). New York: W. H. Freeman and Company. pp. 24—56. ISBN 07167-4947-5. ^ a b c d e f g Ambrose, C. (2006). “Immunology’s first priority dispute―An account of the 17th-century Rudbeck--Bartholin feud”. Cellular Immunology 242: 1. doi:10.1016/j.cellimm.2006.09.004. ^ a b c Fanous, Medhat YZ; Anthony J Phillips, John A Windsor (2007). “Mesenteric Lymph: The Bridge to Future Management of Critical Illness”. Journal of the Pancreas (Department of Internal Medicine and Gastroenterology ALMA MATER STUDIORUM - UNIVERSITY OF BOLOGNA) 8 (4): 374--399. http://www.joplink.net/prev/200707/06.html 2008年7月11日閲覧。. ^ a b c d e Flourens, P. (1859). “ASELLI, PECQUET, RUDBECK, BARTHOLIN (Chapter 3)”. A History of the Discovery of the Circulation of the Blood. Rickey, Mallory & company. pp. 67—99. http://books.google.com/books?id=4QqS6LrYWf4C&printsec=frontcover&dq=william+harvey&as_brr=1&source=gbs_similarbooks_r&cad=2_1#PPA67,M1 2008年7月11日閲覧。. ^ a b Eriksson, G. (2004). “Olaus Rudbeck as scientist and professor of medicine (Original article in Swedish)”. Svensk Medicinhistorisk Tidskrift 8 (1): 39--44.